Who Exactly Is Sarah Palin? Alaska Gov. 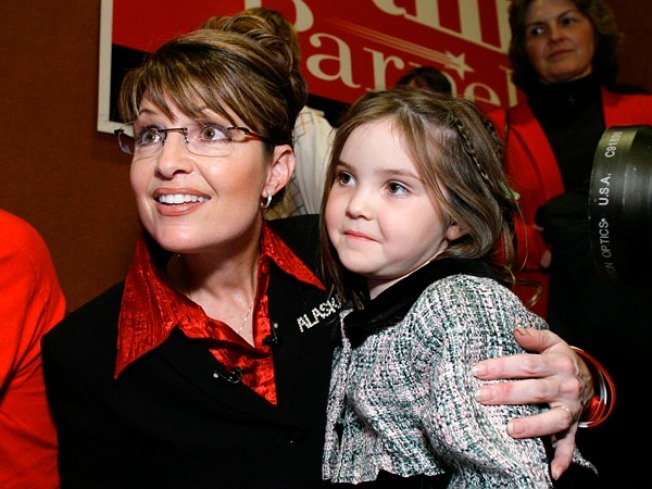 Sarah Palin, here with daughter Piper, has been chosen as John McCain's running mate in this fall's presidential election. In the wake of Alaska Gov. Sarah Palin's selection as the first female to appear on a Republican presidential ticket, the obvious question is: Who is this woman? She was born Sarah Heath in the small town of Sandspoint, Idaho to Charles and Sally Heath, both avid outdoorsfolk. When she was still an infant, the family moved to Alaska. As point guard, she led the Wasilla High School Warriors to the Alaska small school basketball championship, earning the nickname "Sarah Barracuda" for her intense play. Her toughness was tested when she played the championship game with a stress fracture in her ankle. Palin returned to her home state to pursue a degree in journalism with a minor in politics at the University of Idaho. After graduation, she eloped with her high school sweetheart, Todd Palin, a Native Yup'ik Eskimo. While her husband toiled as a commercial fisherman she spent time as a television sports reporter. He has since started a career working in the oil fields for BP. Together they have five kids: Track, who joined the Army in 2007 Bristol, Piper, Willow, and Trig, who was born with Down syndrome earlier this year. She's a self-described hockey mom, having spent many mornings driving her kids to the rick for practice. Her career in politics started in 1992 with her election to the Wasilla City Council. After serving a second term, voters promoted her to mayor in 1996. A decade later she was elected governor, running as a reformer, ousting incumbent republican Gov. Frank Murkowski. She is a longstanding member of the NRA who enjoys snowmobiling, hunting, fishing and mooseburgers.